You know what this cover needs? More roses. There are two blank spots on the page. 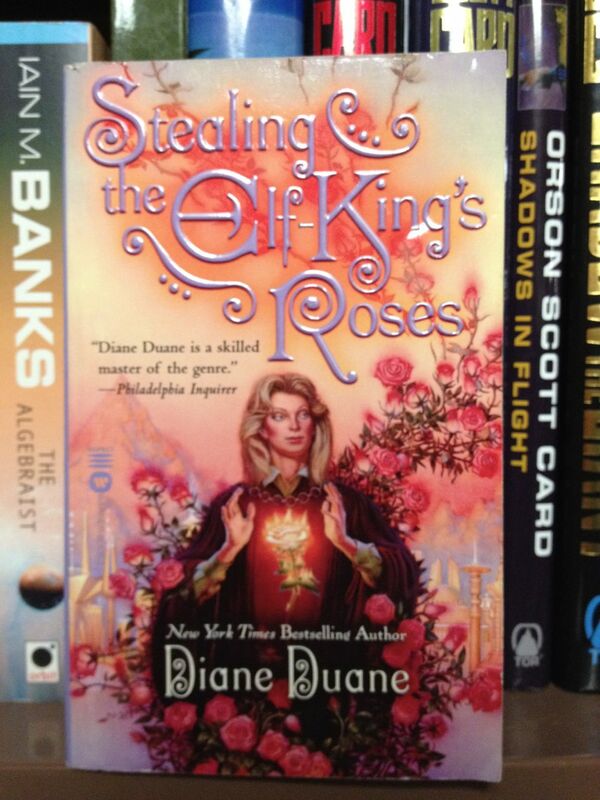 Is “Stealing the Elf King’s Roses” an over elaborate euphemism? That’s some font, that is. It very closely corresponds to my eight-year-old conception of “grown-up fancy writing”. And on your heads put tea cosies. Is that the Elf-King in question, or the accursed rose thief? And is that glowing golden rose floating in space or emblazoned on his/her breastplate? I prefer the sequel, STEALING THE ELF-KING’S QUALITY STREET. How many authors have first names and surnames that differ by just a single letter? I would like to meet an unskilled master. Is the background a candelabra? Two things. First, no matter where they put it, that Warner’s logo still manages to catch my eye. Which, given the entire cover design, is mighty impressive. Second, whoever that is on the cover (Elf-King or Thief), is being played by the mighty actress Mariette Hartley. @Phil-You know, I was so entranced by those oddly ornate capital letters in her name, yet, my God, that is strange, her name, that Diane Duane. Now I will be forced to look at every author to see if…wait, there’s artwork too? It occurs to me you that could just as easily steal someone else’s fancy magic roses, and then claim they came from the Elf King’s garden. What makes the title for me are the emoticons embedded within it. ‘Stealing [Three-Eyed Smiley] The Elf-King’s [Three-Eyed Frowny Face] Roses’. Adds another layer of meaning. I got a fever, and the only cure is more roses! Finally, cover art that the blind can enjoy! Diane Duane is another good author who always got terrible covers. This novel is actually a police procedural (with magic) wherein the leads work for the Los Angeles District Attorney. Now that she’s got the rights to her books back, a cover that won’t end up in romance graces it. @GSS Proselytizer: No question that the new cover is better! Pros: Nice balance with the imagery; well-rendered; font is decent if you’re in that sort of retro mood; Saturn snuck up on me, very creative backdrop. The font is CSI opening titles, which gets across police procedural. And the subtle Saturn is quite nice. Also, no pink or curlicues. I haven’t read the book, but the synopsis there makes it seem extremely non-twee. The quality and relevance of a cover is inversely proportional to the quality of the book. Baen covers are always worse. Hey, I forgot to mention I actually bought this book — with this cover — for a buck at a con last year. Turns out it’s pretty good, and really didn’t deserve this cover, which doesn’t even have the virtue of representing the book. It’s hard boiled cop stuff instead of drippy romance. I’m afraid I’m going to have to ask Tag Wiz to add another tag here: as you all suspected, the title is embossed. Deeply embossed. And shiny. @GSSxN – Back in the day, we didn’t have no fancy “embossing” tag. In fact, back in the day we only had THREE tags: “damsel”, “WTF” and “font problems”. And we managed just fine! @Tag: and you walked to tag school uphill both ways in the snow!